MARK BOBROWSKI vs. BOARD OF APPEALS OF BEVERLY and WALTER CURRAN, PAUL BELMONTE, STEPHEN ERCHA, DAY ANN KELLEY and CLIFFORD CANTLEY, JR., as members of the Board of Appeals of Beverly. Plaintiff, appealing under G. L. c. 40A, §17, seeks to annul a decision (the "Decision") of the Zoning Board of Appeals (the "Board") of the city of Beverly (the "City") upholding a decision of the City's Building Inspector (the "Building Inspector" that property of Plaintiff on Pratt Avenue in the City ("Lot 2") is not a separate buildable lot under the Zoning Ordinance (the "Ordinance") of the City. Plaintiff's vacant lot conforms in all respects with current zoning but is (and has been) owned in common with Plaintiff's non-conforming house lot. I rule that the vacant lot is not buildable. Plaintiff has moved for Summary Judgment. Plaintiff's motion was argued by counsel on November 1, 1991. Counsel stipulated at the hearing that there are no genuine issues as to any material fact. 1. Plaintiff, Mark Bobrowski, is the owner and resident of land located at 48 Bisson Street, Beverly. 2. 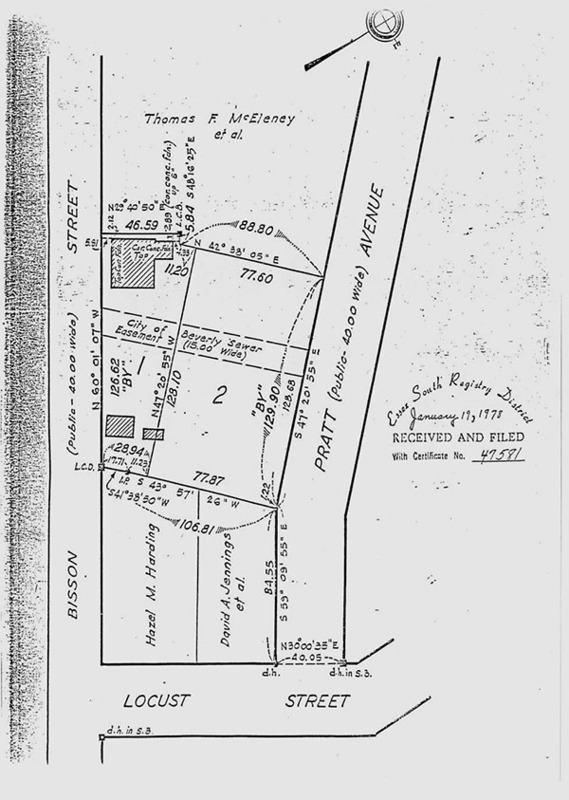 Plaintiff's property (the "Property") has frontage on both Bisson Street and Pratt Avenue, and is described on the Land Court Certificate of Registration (Exhibit 1) as "Lots 1 and 2". A copy of the Land Court Plan is attached. The total area of the Property is 15,683 +/- square feet. The Property is located in an R-10 Zoning District (See Exhibit 2), which requires a minimum lot size of 10,000 square feet and 100 feet of frontage. See Section 29-11.D of the Ordinance in Exhibit 3. 3. Lot 1 contains 5656 +/- square feet and has 126 +/­ feet of frontage on Bisson Street. 4. Lot 1 contains two structures, a single family residence erected in approximately 1910, and a small garage. See Affidavit of Dorothy L. McEleney, para. 2, in Exhibit 4. 5. Lot 2 contains 10,027 +/- square feet and has 129 +/- feet of frontage on Pratt Avenue. 6. Lot 2 has no structures on it. See Affidavit of Dorothy L. McEleney, para. 3, in Exhibit 4. 7. In February of 1939, Beverly adopted its first zoning ordinance. The Property was placed in a "General Residence" District and Lot 1 became nonconforming as to front, side and rear yards. See Exhibit 7 (1939 Beverly Zoning Ordinance, Section 6) and Exhibit 4, para. 4. In February 1939, the two lots were not held in common ownership, Lot 2 being then owned by Dorena Gorini and the major portion of Lot 1 by Dorena Gorini and John Julian. 8. By virtue of a 1943 deed from John Julian and several intra-family conveyances, title to both Lots came into Vivian and Victoria Gorini in 1943; see deed of November 26, 1943 by which Mario and Dorena Gorini transferred their fee interests in all of Lot 1 (both the 1920 and 1922 portions) and Lot 2 to Vivian and Victoria Gorini, reserving a life estate. See Book 3357, Page 33-34 in Exhibit 9. Lots 1 and 2 have been in common ownership ever since. 9. The Property was registered by the Land Court on January 18, 1978 as Lot 1 and Lot 2. See Exhibit 1. 10. The Property was conveyed to Rex H. and Renee U. Garrett by Victoria Gorini on August 15, 1978 and thence to Mark Bobrowski and Mary Norton Bobrowski on December 22, 1986. See Exhibits 10 and 11. 11. The Property is taxed as two separate parcels. Lot 1 is Tract #319 on Beverly Assessors Map 21. Lot 2 is'Tract #295 on the same map. See Exhibit 2. 12. The Ordinance defines "lot" as "a parcel of land in identical ownership throughout of at least sufficient size to meet the minimum requirements of this Ordinance for use, coverage, and area and to provide for required yards and other open spaces." See Section 29-2.B.29 in Exhibit 3. 13. The Ordinance defines "nonconforming lot" as "a lot of record at the time this Ordinance becomes effective but which does not conform with the regulations for the district in which it is located." See Section 29-2.B.30 in Exhibit 3. This Chapter or any amendments thereto shall not apply to existing buildings or structures, nor to the existing use of any building or structure, or of land to the extent to which it is being used at the time of the adoption of this Chapter or Amendment ...." (emphasis added in text, not caption) (irrelevant portions deleted). Any lot lawfully laid out by plan or deed duly recorded, as defined in Section 81L of Chapter 41 of the Massachusetts General Laws, or any lot shown on a plan endorsed with the words "approval under the subdivision control law not required" or words of similar import, pursuant to Section 81P of Chapter 41 of the Massachusetts General Laws, which has a lesser area, frontage, width, and depth required under this amendment for the district in which such lot is located shall be subject to the provisions of Chapter 40A, Section 6 of the Massachusetts General Laws. The minimum side yard for such lots shall not be less than eight (8) feet. 16. On July 13, 1990, Plaintiff requested a determination from the Building Inspector that Lot 2 constitutes a building lot under the ordinances. On July 24, 1990, the Building Inspector refused the determination. On August 1, 1990, Plaintiff sought a reconsideration but on September 6, 1990, the Building Inspector again refused to determine that Lot 2 is a building lot. The Board voted 3-2 to upold [sic] the decision of the Inspector of Buildings. It was determined that Lot 2 cannot be a separate lot of record, since to do so would render Lot 1 non-conforming. If separated, Lot 1 would require a dimensional variance, as the land was merged with Lot 2 by Mr. Bobrowski, when acquired in his ownership. 18. When Vivian and Victoria Gorini took title to Lots 1 and 2 in November, 1943, thereby placing the two lots in common ownership, the minimum lot size for a buildable lot under the Ordinance was 4,500 square feet. The requirement was increased in 1965 to 10,000 square feet, the present requirement. 19. Counsel stipulated at the hearing that: Lot 2 is a fully conforming lot, apart from the question of the impact of its history with Lot 1; the aspects in which Lot 1 was non-conforming in 1939 when zoning came into effect were the front, side and rear yards; and lot size conformed at that time but became non-conforming in 1965. Plaintiff argues, and Defendants deny, that this action should be determined on the basis of the first sentence of the first paragraph of G.L. c. 40A, Section 6 ("First Sentence/First Paragraph/Section 6"). Defendants argue, and plaintiff denies, that this action turns on the first sentence of the fourth paragraph of Section 6 ("First Sentence/Fourth Paragraph/Section 6"). 20. Defendants argue that adjoining lots in common ownership are generally merged to satisfy new requirements (in this case the 10,000 sq. ft.) and that the merged lot is 15,683 sq. ft., leaving Plaintiff 4,317 sq. ft. shy of a buildable lot. 21. I am not aided by the definitions set forth in paragraphs 12 and 13 above. Section 29-26.A, quoted at paragraph 14, encompasses the dwelling on Lot 1. It does not expressly deal with lot size and in that it mirrors, and does not augment, the First Sentence/First Paragraph/Section 6. Section 29-5.B, "Undersized Lots of Record", quoted at paragraph 15 above, encompasses Lot 1 and refers as to the First Sentence/Fourth Paragraph/Section 6 (counsel agree that the second sentence is not applicable). 22. The First Sentence/First Paragraph/Section 6 states in relevant part that "Except as hereinafter provided, a zoning ordinance or by-law shall not apply to structures or uses lawfully in existence or lawfully begun..." None of the exceptions referred to are applicable here. Any increase in area, frontage, width, yard, or depth requirements of a zoning ordinance or by-law shall not apply to a lot for single and two-family residential use which at the time of recording or endorsement, whichever occurs sooner was not held in common ownership with any adjoining land, conformed to then existing requirements and had less than the proposed requirement but at least five thousand square feet of area and fifty feet of frontage. 24. Plaintiff argues that the non-conformities which afflict Lot 1 are the yard setback violations which arose when zoning was adopted in 1939. He then proffers arguments why those should not taint Lot 2. That approach is a red herring. Defendants(correctly, I rule) do not point to the setbacks as the problem. Defendants say the problem stems from the 1965 increase in required lot size from 4,500 sq. ft. (with which both lots comply) to 10,000 sq. ft., with which only Lot 2 complies. I agree. 25. The First Sentence/Fourth Paragraph/Section 6 does not protect Lot 1 with respect to the 1965 increase. Under Adamowicz v. Town of Ipswich, 395 Mass. 757 (1985) the inquiry as to common ownership is to "the most recent instrument of record prior to the effective date of the zoning change." (p. 762). That instrument was the November 26, 1943 deed into common owners, Vivian and Victoria Gorini. 26. Plaintiff argues that First Sentence/Fourth Paragraph/Section 6 applies only to vacant lots, citing Willard v. Board of Appeals of Orleans, 25 Mass. App. Ct. 15 (1987) at page 17. The citation is accurate but unhelpful here. The Court there was	disposing of an attempt by one of the parties to move discussion away from First Sentence/First Paragraph/Section 6, which clearly dealt with the matter at issue (expansion of a non-conforming structure). Plaintiff's citation does not dispose of the problem in this action. 27. The interaction between the First and Fourth Paragraphs of Section 6 is not explicit. First Sentence/First Paragraph/Section 6 never mentions lots, after all (no more than does Section 29-26.A of the Ordinance). I conclude, however, that it does, by implication, in some contexts protect the lot on which a pre-existing structure stands. For instance, an increase in lot size requirement to a number greater than the structure's lot would not make the lot illegal, only non-conforming (and grandfathered). 28. However, I do not agree with Plaintiff's next step, which is to say that a structure's lot is protected in all aspects. Specifically, I conclude that a built-upon lot is subject to the same considerations as to merger of lots - more particularly, the policy of minimizing non-conformities - that apply to vacant lots - as expressed in First Sentence/Fourth Paragraph/Section 6 and in case law relative to merger of lots generally. See Sorenti v. Board of Appeals of Wellesley, 345 Mass. 348 (1963) as to minimizing non-conformity. 29. I have found no cases which address these questions directly, and none are cited by counsel. Plaintiff cites a recent case here, Silun v. Sutton Board of Appeals, Miscellaneous 143836. In Silun a non-conforming grandfathered lot with a structure was in common ownership with a lot which at first was conforming and was later rendered non-conforming by a lot size requirement increase. The Planning Board, citing common ownership at the time of the zone change, held the lots had merged. Judge Sullivan reversed, but did so on the strength of two provisions of the Sutton By-Law, absent in this action. 30. The answer here is not prompted by consideration of the language of the title instruments. The Certificates of Title describe the property by a unified description (suggesting one lot) but go on to refer to the property as being comprised of Lots 1 and 2 (suggesting two lots). 31. Barring precedent on point and with no help from the local ordinance, I believe this action comes down to the policy consideration of minimizing non-conformities. I therefore uphold the Decision of the Board and grant Summary Judgment in favor of Defendants.